Bad Pacino Scorecard: Author! Author! Near the end of Author! Author!, Al Pacino’s character, an Armenian playwright named Ivan Travalian, is slumped backstage at the premiere of his troubled play, anxiously listening to the audience. You wonder now if Pacino himself knew he was forecasting the audience’s reaction to the film. There’s not a laugh to be found in Author! Author!, a supposed “comedy” from 1982 that ran deep in the evening on AMC this week. So many things run wrong with this film, from the script, to the casting, to the editing, that it’s a minor miracle it exists in any sort of form to run late-night on a cable channel. We’ve already lauded Al’s willingness to stretch as an actor and here he was in a period where he was really pushing the limits, perhaps tired of the street-wise, world weary roles that had made him a star. He had famously starred as a cop who goes undercover in the gay underworld in Cruising. (This enraged family values groups and gay-rights groups both at the time.) And he had not yet appeared in his own personal Heaven’s Gate, a career-killing historical film called Revolution, that, frankly, I remain terrified to see. And his next film would be a modest, subtle little film called Scarface. So it was only natural that Pacino would sign on to appear in a comedy about a neurotic New York playwright who lives in a chaotic household with six children to whom he serves as a largely surrogate father. How neurotic? Pacino only eats greens; he’s a wacky vegetarian. And when he walks around and says he’s depressed, you can’t help but laughing, but Al Pacino doesn’t mope and tell you he’s depressed, like he’s Woody Allen or something, he shows you he’s depressed, by, say, drinking himself into a stupor and banging Ellen Barkin in Sea of Love. Pacino is married to Tuesday Weld, who is set up as perhaps the Worst Mother of All Time. Her M.O. is to marry a guy, have children, and leave him behind, which is how Pacino ends up with most of her kids, even though he isn’t the father. Get it? Weld, of course, ditches Pacino with the kids and takes off with a guy named Larry, who paints lighthouses in Gloucester, Massachusetts. Seriously. And Pacino is so bothered by this that he keeps inserting Larry’s name into the play he is writing. Get it? Pacino as a parent is somewhere between distracted and negligent, continually leaving his kids in the charge of the eldest, his wisecracking son named Igor. But it’s Al Pacino. So what if he looks like he would rather be anywhere else than taking care of this brood (or in the movie at all)? He’s more like a harried branch manager. And the kids range from obnoxious to precocious, with the youngest one stuck with the well-worn shtick of cursing all the time. This is a film that has Dyan Cannon playing a famous actress (more famous than actually herself at the time) named Alice Detroit who is wooed to be in Pacino’s play, called “English With Tears.” As a serious stage actress, Cannon projects as much gravitas as, say, Tom Hanks in “Bosom Buddies.” She takes an aspirin before each drink of champagne because champagne gives her a headache. 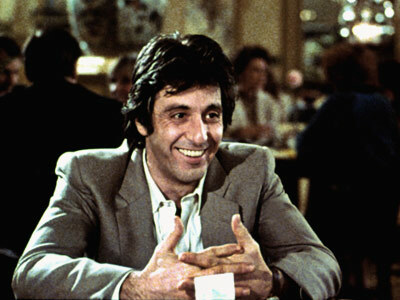 Cannon’s character and Pacino’s character literally meet, get involved, and decide to live together all in about a 20-minute stretch in the second act. She has a couple of scenes where she finds out life with kids isn’t so easy and she’s gone faster than an alley cat from a kicked-over trash can. Pacino, so inspired, decides to get his wife back, and takes a cab from Greenwich Village to Massachusetts, just so he can, honestly, commit one would only be considered now, at least a serious domestic violence misdemeanor, if not a felony. This is a movie with Alan King playing, well, himself, chewing everything in sight, the aged comedy team of Bob and Ray as a wily Broadway financiers (huh?) and Richard Belzer playing (we think) a gay stage manager. We, sadly, get almost no token-Pacino histrionics, either because the entire enterprise seems to be stuck in second gear or he simply couldn’t muster the energy. This entry was posted in Bad Pacino Scorecard by James Oliphant. Bookmark the permalink. it . it shows everthing back the it was befor.